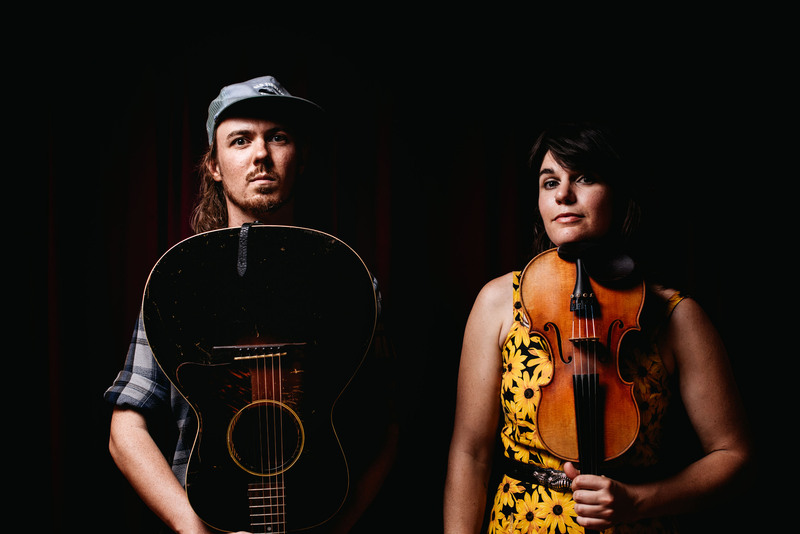 Hoot and Holler is a groovy young folk/roots duo that blends old time Appalachian traditions with fine contemporary songwriting and musicianship on fiddle, guitar and banjo. Brought together by a mutual love for American folk music, Amy Alvey and Mark Kilianski have been entertaining audiences all over the USA since 2013. After cutting their teeth in Boston’s burgeoning roots music scene, Amy and Mark spent the better part of 2016 touring the United States while living in their camper van “Irene”. Ever inspired by the enduring spirit of traditional Appalachian mountain music, they now make their home in Asheville, North Carolina. Both Amy and Mark are alumni of the prestigious Berklee College of Music in Boston, and combine the polished technique of conservatory training with the grit, drive, and soul of their musical heroes, legendary mountain musicians like Roscoe Holcomb and Ola Belle Reed. Equally influenced by wordsmiths like Gillian Welch and Townes Van Zandt, Hoot and Holler have released an EP and a full-length album to date, plus a footstomping collaborative release with the Old Time Snake Milkers.​ The duo has performed at venues and festivals across the USA and Australia including Australia’s Dorrigo Folk and Bluegrass Festival, the Portland Old Time Gathering in Oregon, and the New England Americana Festival to name just a few. Both Mark and Amy have also proved their Appalachian music credentials by achieving multiple placings in the instrument contests at West Virginia’s Clifftop festival and the Mount Airy Fiddler’s Convention. Both when performing and when teaching workshops, Hoot and Holler strive to honour the ancient sounds of those who came before, while bringing their own unique voice to the stage. We’re delighted to be working with Hoot and Holler on their debut tour of the UK and Ireland. Now booking for gigs, festivals and workshops in late Aug/early Sep 2019. Please contact us for availability!